OK...look at this amazing cookie by Zoe's Sweets! I just LOVE it! 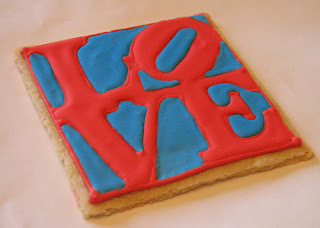 Be sure to check out her other amazing heart and valentine cookies. They are too cute! Thanks so much for posting my LOVE cookie and link! I have a question: I noticed that your husband sometimes makes cookie cutters for you - can you tell me where he gets the metal strips/what gauge he uses? Does he solder them together? I'd like to make some special shapes of my own, and I would really appreciate the information! Now you've gone and made me HUNGRY! LOL. Hey Zoe! Thank you for letting me post it! On the cutters, we haven't quite graduated to soldering yet. What he does is "re-imagine" a current cutter. :) We'll buy a cutter that looks to the the size that is needed for the new shape, a circle usually works well. Then he sketches a design and re-shapes the cutter. Now, that part, I'm not quite sure how he does it. I try not to hover. :) I'll have to see if he will post something on it sometime. So sweet i really love it. I feel so fortunate to have met you in person, congratulations on your book and upcoming success, watch out Martha!!! !